Look for this Air Jordan 11 PRM Heiress “Black Stingray” to release on Black Friday, November 24th at select Jordan Brand retailers and Jordan.com. The retail price tag is set at $220 USD. Extended sizes to 10.5Y (instead of usual 9.5Y). UPDATE: Jordan Brand debuts the Air Jordan 11 Heiress “Black Stingray” tomorrow, Black Friday in extended sizes to 10.5Y. UPDATE: Perhaps the most popular Jordan model of all time, the Air Jordan 11 arrives this holiday season in an exclusive new women’s make up: the “Heiress.” The new royal twist comes from swapping the silhouette’s familiar patent leather for a premium suede upper featuring glittering accents and Gold details. While a surprise release went down today, November 14th via Nike SNKRS, a wider release will go down on Black Friday, November 24. UPDATE: Nike releases official photos of the “Black Stingray” Air Jordan 11 Heiress. 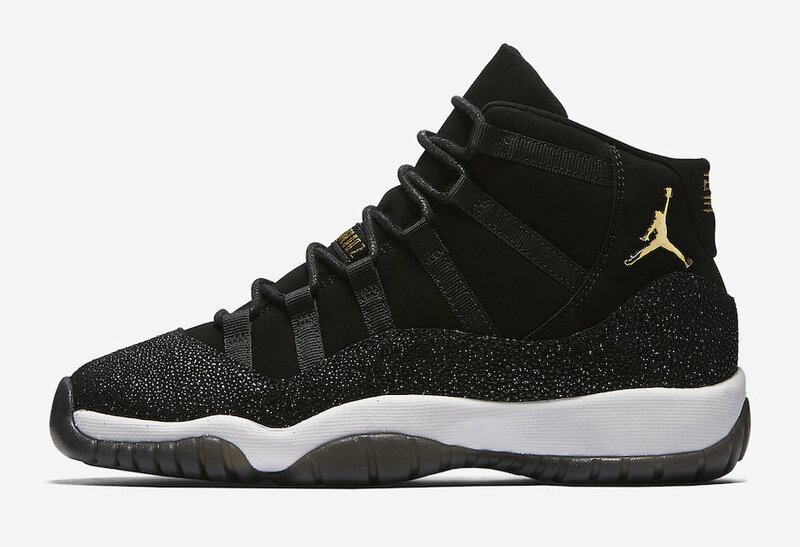 UPDATE: Detailed look at the Air Jordan 11 Heiress “Black Stingray” via FineLine1721.